The fact that a boy is an Eagle Scout has always carried with it a special significance, not only in Scouting but also as he enters higher education, business or industry, and community service. The award is a performance-based achievement whose standards have been well-maintained over the years. Not every boy who joins a Boy Scout Troop earns the Eagle Scout rank; only about 5 percent of all Boy Scouts do so. This represents more than 1 million Boy Scouts who have earned the rank since 1911. Nevertheless, the goals of Scouting-citizenship training, character development, and personal fitness-remain important for all Scouts, whether or not they attain the Eagle Scout rank. The Shenandoah Area Council Eagle Board has developed it's Life to Eagle packet to assist Scouts, leaders and families along the “Trail to Eagle.” All elements support the official BSA Eagle Scout Leadership Service Project Workbook and the Eagle Rank Application. It is the desire of the Council Eagle Board to provide information and guidance to individual candidates and to Troop and Crew leadership to make the Eagle Scout process one that is clear, smooth and one that produces the work and fine qualities that should be demonstrated by a youth striving for Scouting’s highest rank. All proposals must be turned into the office the Friday before the Eagle Board of Review (which is always the 3rd Tuesday of every month, unless otherwise specified) and all final projects must be turned in by the 1st of that month to be seen that month. Final projects must be turned into the Scout Office the day of or prior to the candidate's 18th birthday to be considered. As of September 1st 2016, all Eagle Scout Boards of Review are now being conducted at the local District level. The Eagle Scout project proposals are due by the 1st of each month to be considered for review by the Council Eagle Project Review Committee that month. These projects will be reviewed on the 3rd Tuesday of that month. Project proposals can be picked up after the Committee has completed their review. Completed Eagle Scout Projects are due by the 1st of each month to be considered for an Eagle Scout Board of Review that month. Once the Council Registrar is confident that all requirements have been met with regards to the Eagle Application, the project and application will be reviewed by the Council Eagle Project Review Committee for the second time to confirm completion. Once this process is complete, the Council Registrar will contact each District Eagle Board Chairman and provide them with the Eagle Scout Candidate contact information to set up a Board of Review. After the Eagle Board has completed the Review, the Eagle Board Chair will return all paperwork to the Council office for the Registrar to submit it to the National BSA office for approval. If you have any questions please see your District Advancement Chair or District Chair. The Shenandoah Area Council NESA committee meets the third Tuesday of the months of March, May, September, November, and December at the Council Service Center. The meetings start at 6:00 PM, prior to the Eagle Scout Board of Reviews. All Eagle Scouts, regardless of membership status in NESA, are welcome at this meeting. NESA membership: Current applications to join NESA may be obtained at the NESA national web site: www.nesa.org. 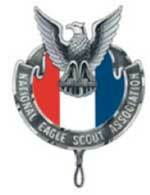 Eagle Scout Scholarship: For more information and an application, go to www.nesa.org. Eagle Scout Light Box: NESA Committee manages the Eagle Scout Badge Light box reservations. The Eagle Scout Light Box Reservations form may be downloaded, completed and then forwarded to the address at the bottom of the form to request reservations. While the Eagle Scout Badge Light box is stored at the Council Service Center and is normally picked up and returned to the Council Service Center, the reservations are not managed at the Scout office. Click HERE for the Eagle Scout Lightbox Reservation Form to physically fill out and send into your District Executive. The Eagle Scout Badge Light Box is on a first come, first serve basis. Click here to download a sample ceremony that may be used with the Eagle Scout Badge Light Box. This ceremony is based upon the Eagle Scout Charge that national normally sends with the Eagle Scout award and certificate. Feel free to use any ceremony that you feel is appropriate for your unit. If you are an Eagle Scout and interested in getting involved in Scouting again, be it a small task such as a becoming a merit badge counselor, helping out as a Campmaster, or helping staff a scout event such as a Camporee; or a large task such as becoming a unit leader or district committee member please contact us. We can help match your interests with council needs. This will help us provide great program and allow you to once again enjoy the fun of Scouting!